So far we have discussed two of the three core components of the Froogle DBA’s toolbox (Central Management Servers and Extended Properties). With these two features we can manage systems at scale by improving our ability to apply scripts to all or a portion of our environment, make our environment more self-documenting, and improve communication between the members of our DBA team. In my last post I showed you how you can populate folders in CMS using the Extended Properties you have defined on your databases using PowerShell. There is an issue with this approach however. It makes it more difficult (not impossible) to answer the question “Which databases don’t have Extended Properties set?”. This is a limitation that the Management Data Warehouse can help us overcome. The Management Data Warehouse (MDW) is a database that collects data sent by data collectors running on the same, or different, instance(s) of SQL Server. That is to say that it is really just like any other database, except this database is populated by Data Collectors configured in Instances of SQL Server to gather information of interest. Out of the box, SQL Server provides Data Collectors that can be configured to collect information of interest in troubleshooting performance problems in SQL Server. It also ships with some reports designed to run inside of SQL Server Management Studio to analyze this data. Setting up Management Data Warehouse involves two steps. First, we need to create the Management Data Warehouse database on the server we want to consolidate data in our environment on. For the Froogle DBA we will use the same instance of SQL Server we use to host Central Management Server to host the Management Data Warehouse database. We will do this to facilitate some of the other integrations that make the Froogle DBA framework easier to support and maintain. Secondly, on each of the instances you want to gather data on, you will need to configure Data Collection to report to the Management Data Warehouse database. In order to configure the Management Data Warehouse database you will need to follow the images below. On the instance of SQL Server you want to host MDW, expand Management, right-click “Data Collection”, select “Tasks”, and then select “Configure Management Data Warehouse”. Back on the Configure Management Data Warehouse Storage screen click “Next”. Add logins that you want to have access to the MDW on this screen and then click “Next”. Then click “Finish” to perform the install. All the checks should come back green. Now that we have a place to put data we collect, we need to tell SQL Server to collect data we can later use. In order to do this we need to configure Data Collection. The Data Collection is going to be run as jobs on the instances of SQL Server that are collecting. As such you need to be aware of the account that the SQL Server Agent is running on each of the machines and ensure the accounts have the appropriate permissions in the MDW database, or you can configure an account for Data Collection to run as and use proxies to run Data Collection as that account. Some data collection relies on caching data in a folder in the file system. Go ahead and create a folder for this purpose (i.e., C:\MDWCache) and then make sure that the account that is going to perform Data Collection has full control on the folder. In order to configure collection follow the steps in the following images. Expand “Management”, right-click on “Data Collection”, select “Tasks”, and then select “Configure Data Collection”. Click the “…” button next to Server Name. Connect to the Instance hosting the MDW database and click “Connect”. Select the MDW database from the Database drop down. Click the “…” button next to the Cache Directory. Navigate to the Cache directory you created and click “OK”. Select the data collectors you wish to add and then click “Next”. All checks should come back green. At this point you have Management Data Warehouse up and running and the default collectors collecting data. Don’t forget to configure Data Collection following the second set of images on all the instances you wish to manage. We will show how to use the data collected and some custom collectors important to the Froogle DBA later. In the first post on the Management Data Warehouse we looked at how to set it up and start collecting default data using Data Collection. In this post, we will see how to create a custom collector to gather all Extended Properties at the database level on our Instances configured for Data Collection. This shows how easy it is to create a custom collection set and collect information about our SQL Server instances. Before we dive into the process, lets discuss a little more about what we are trying to accomplish. If you have been following along with the Froogle DBA posts, then you know that I recommend you document your database inside the databases themselves using Extended Properties. By doing so, you can use Central Management Servers to report on your environment. But sometimes it is just easier and faster to query this information from a single source. Since we are already leveraging Management Data Warehouse why don’t we use it to consolidate this information from across our environment. We are going to gather all Extended Properties set on databases, once a day and store them in the Management Data Warehouse database. We are going to decide we are not going to keep a lot of history on this information, so we will just keep one weeks worth of data. With this information let’s start working on building our collector. To start with we need to understand that the way data collection works is that a collector is going to run on each of our instances and report back to the Management Data Warehouse. This is a distributed collection model and means we will eventually need to “install” this collector on each of our instances. The implication of this is we will only need to worry about writing a collector to gather information for one instance and then deploy that collector to all of our instances. We can also further simplify the process of creating the collector by using the data collection’s ability to run a script against all user database on an instance. With this we only need to write a query to gather the database level Extended Properties for a given database. The query we will use is shown below. The reason we perform the left join is to ensure that we get at least one row per database. The default collectors that come with SQL Server are gathering data at the instance level and not the database level. We could use the query below, but we would not be able to answer the question in MDW of which databases are missing Extended Properties. So now that we have our query let’s dive into the process of creating a Data Collection Set. A Data Collection Set is made up of a Collection Schedule, and a series of Collection Items. We will have just the one collection item which will gather the Extended Properties. If we had other things we would like to collect once a day it is best practice to add them as additional items to a single Collection Set vs. having individual Collection Sets for each. This greatly improves the scalability of Management Data Warehouse. So let’s address each of these one at a time. We’ll tackle them in reverse order starting with the Collection Set. Activity. Since the information we wish to gather is based on a T-SQL query we will be using the Generic T-SQL Query Collector Type. Each collector type has a different set of information it needs which is provided in an XML segment to the Data Collection engine. against. You can look at the Generic T-SQL Query Collector Type link for more specifics, but the XML segment we want to use is as follows. This segment says to run the query against all user databases (<Databases UseUserDatabases=”true” />) and store the results in a table in the custom_snapshots schema in the Management Data Warehouse called “ExtendedProperties” (<OutputTable>ExtendedProperties</OutputTable>). We will need to wrap this XML in a stored procedure call later, but before we put this together we need to address the issue of scheduling. SQL Server ships with 6 schedules for Data Collection Sets. They are all designed to run multiple times a day. There are collection schedules available for collecting at 5, 10, 15 and 30 minutes. There are also collection schedules available to collect at 1 and 6 hours. We could just use the 6 hour collection and collect multiple times a day. But since we don’t have a business need to do so we will take advantage of the fact that we can create our own schedules. All of the schedules created for data collection all start with “CollectorSchedule_”. To avoid confusion (and the chance that SQL Server adds a daily collection schedule in the future) we will avoid using that convention. We’ll use “Collector_Schedule_” instead. In order to create a new schedule we need to use the sp_add_schedule stored procedure in the msdb databases. If you are interested in all the options available you can refer to the information in BOL. But for our purposes to create a schedule to run daily at 01:00 we would use the following script. We will intentionally not include the time of day in the name of the schedule, because as our environment grows (or if you have a large environment already) we may need to stagger the times that instances report into Management Data Warehouse to improve performance. So now that we have the xml segment for the collector and the schedule, lets put it all together into a single script which will create the schedule if needed, drop the collection set if it exists, create the collection set, and then finally start up the collection set. This is the script that we can use with Central Management Server to get all of our Instances collecting Extended Properties and reporting them to the Management Data Warehouse. 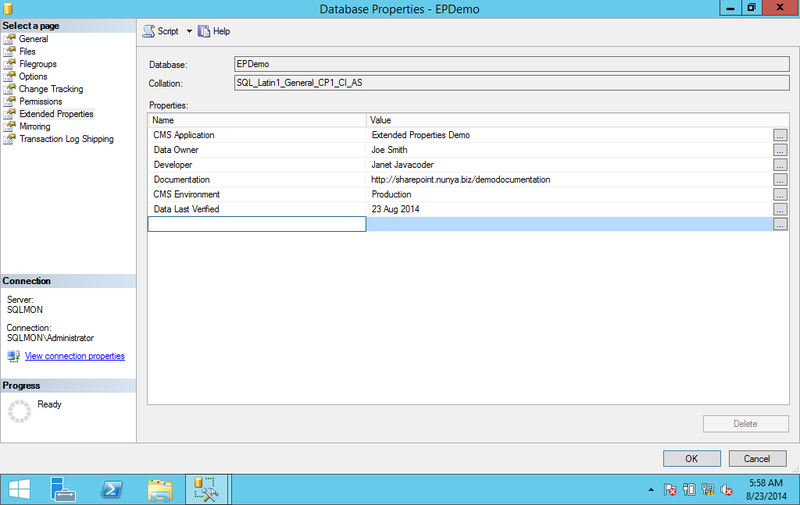 So now we have a collector we can use to collect Database Extended Properties for all our user databases. Once we deploy this to all of our SQL Server instances we will have a central repository of this information we can use. There are many other collectors we could write to gather information on our environment. We will save those for another time. I hope you have been enjoying the Froogle DBA series. I would love to hear any feedback you might have. An issue that has always come up with 3rd party applications that run on top of SQL Server is their insatiable desire to have sysadmin role access to the instance they run on. It is an issue I have dealt with for as long as I can remember. Historically, the documentation would ask for the access, but when it came down to it we always found a way that they could get by with lesser permissions (i.e., db_owner and maybe throw in some permissions in msdb to manage jobs). But lately, we have been seeing more and more applications that are building sysadmin role checks into their installers and not moving forward without it. Microsoft even requires it for System Center Operations Manager and other products. My team is a cautious bunch, and we try our best to use shared instances as much as we can to keep down costs (we run a density of about 25 databases per instance). Which means we are spending more time these days tracing installs and negotiating with vendors on permissions on these 3rd party applications. For those of you who came to this page looking for the silver bullet, I am sorry that is not the purpose of this post. Instead, I am interested to here what you all have tried to manage this issue. I but together a quick light hearted survey to try and see how most people are handling this issue. I am also interested to hear if anyone has found a great way to deal with this issue. The survey is hosted by SurveyMonkey. Before I dive into the next component in the Froogle DBA’s toolbox, I wanted to give you all an idea of what’s to come. In the original Froogle DBA plan on which my SQL Saturday presentation was built there are three component involved in automatically documenting the managed environment in Central Management Servers (CMS). I already went over Extended Properties and showed you how to add them to a database. I spoke a little about the advantage of using Extended Properties to document your environment. I even talked about using CMS to query the Extended Properties to answer some common questions. While I was procrastinating from working on my presentation it dawned on me that not everyone will want to run the other piece of the Froogle DBA trinity, Management Data Warehouse (MDW). A lot of people will already have monitoring tools in place, and MDW is probably the hardest piece to scale and manage. So I thought, how could people take advantage of tighter integration between CMS and Extended Properties without having to run MDW. So I spent some time today an through together a PowerShell script that can be used to populate groups in CMS based on Extended Properties you have defined on your databases. The idea is that you will have a group inside of CMS that lists all the Instances of SQL Server you manage. This script will query all the Extended Properties defined at the database level on these instances. It will then look for those that start with a specific Prefix (the default is “CMS “). It will then build a group for each of these properties under the root of the CMS, removing the prefix, So, for example the Extended Property “CMS Application” would create a group in CMS called “Application”. It will then build a sub-group for each unique value defined for that Extended Property. Then lastly it will register all the instances of SQL Server that had that value under the sub-group. For example, if you have a database on Instance1 and another on Instance2 with the Extended Property “CMS Application” set with the value of “Application 1” you would see the results in the following picture. Now I need to fully disclose that this is a script that I have not run in production. So, please verify this in a test environment before turning it loose on production. And, I would be very interested on any feedback you might have on the script. Did you find it useful? Did you need to modify it to fit in your environment? Have ideas for enhancements? Well, I guess it’s time to reveal the script. 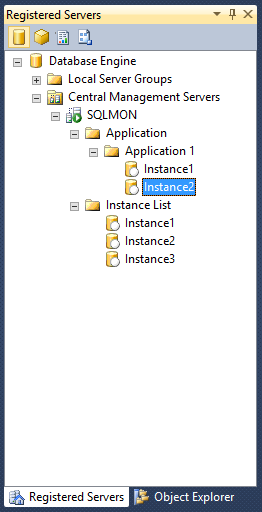 #               instances if found in the query of Extended Properties. 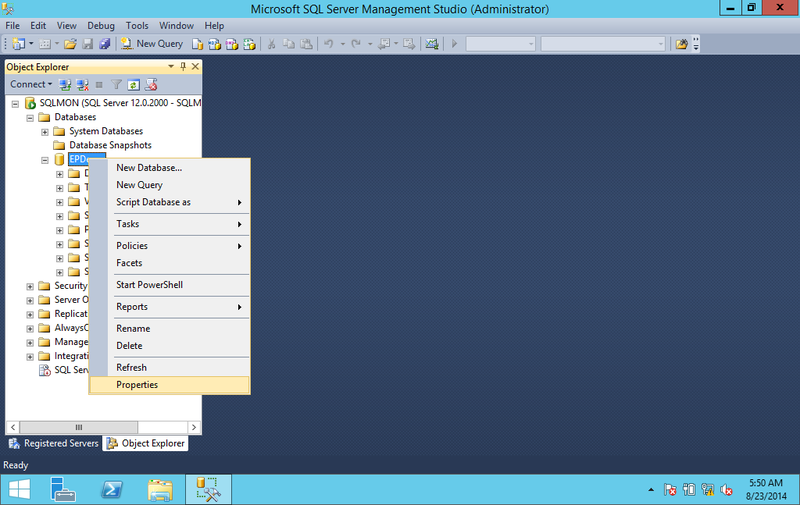 #               SQL Server Management Studio. #  all copies or substantial portions of the Software. So we had a customer that had a slow application but wasn’t sure what queries were causing them problems. We provide access to our customers to see a dashboard that allows them to drill down into waits to find slow responding queries, but the interface was too much for them to digest. Other database platforms that I support allow you to log queries running longer than a given amount of time to a log so that they can be analyzed. I thought it would be helpful to provide the same functionality to these customers to help them identify their problem areas. I’ve been looking at an excuse to play with Extended Events and thought this would be a good opportunity to help out my customers and learn something new. The plan was was to use Extended Events to log queries taking more than 500 milliseconds to a file. I could have used other targets, but I am thinking of possibly throwing this data into Hadoop later. (If I do, I’ll be sure to blog about that as well.) Setting up the Extended Event Session was not that difficult. I based it off of Paul Randal’s blog post on logging queries that were expensive based on CPU. After modifying it to filter based on duration and not CPU as well as removing some noise from the results this is the script I used to set up and start the Extended Event Session. This script sets up a collection and stores the queries in a file on the operating system. But instead of having to grant everyone access to the file to see the contents I created a stored procedure that read the contents of the file and formatted them into something more useful. I started with the select in Paul Randal’s blog post but in order to run the sys.fn_xe_file_target_read_file function you need to have VIEW SERVER STATE permissions on the server. I wasn’t excited about granting everyone access to this, so I decided to sign the procedure with a cert to allow permissions to everyone. This process was modeled after the SQL Server Separation of Duties Framework. The process involves making sure that master keys exist in both the master and ModernDBA databases. Then setting up a certificate that matches in both databases. Then you can associate the certificate with a login that has the VIEW SERVER STATE permission and use the certificate to sign the procedure in the ModernDBA database. This will allow the procedure to run as the login and get to the slow query log files. Before you run the script below you will want to change the password to something a bit more secure. Now that the query is created all we have to do is grant any users we want to be able to see the slow query log access to the public role on the ModernDBA database. To do that we can use this script. Now that we have granted the user access to the stored procedure they can perform filter selects against the data using common TSQL techniques. One such method is to load the data into a temp table as shown below. While this query returns all the data you could easily modify the SELECT statement to only return the rows of interest. This process will store 5 1GB files worth of slow queries that can be looked at by the customer. Performance of reading the files in is a bit on the slow side once you have some data in them. That is why I have excluded the stored procedure from the Extended Event Session. Longer term, I may load this data into a table and grant access to the table. But for now this helped my customers identify queries that needed tuning and was relatively easy to set up. 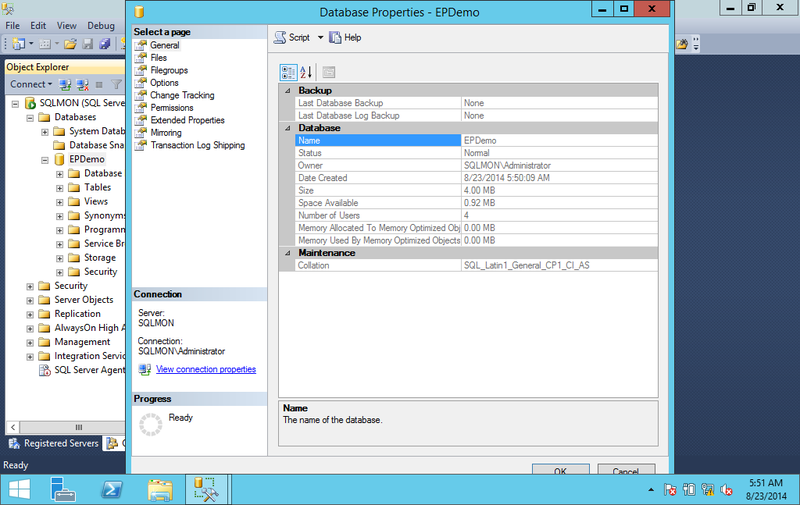 How have you set up access for your customers to see slow performing queries in SQL Server? In the previous blog post we introduced Central Management Servers (CMS) and went over how to set one up and create groups and add servers. Central Management Servers provide the Froogle DBA the ability to centrally manage their environment and share a common list of instances with other DBAs on their team. The power of CMS really begins to grow however when you have it set up so you can apply scripts and evaluate policy to groupings of like instances. For example, if we are asked to tell us what applications are still running on SQL Server 2005 instances it would be great to have a group in CMS defined in CMS with just SQL Server 2005 instances in them. We could then query the group to return the list of database names on all SQL Server 2005 servers rather quickly. But how do we figure out what application these database support. One way would be to keep track of the mapping of databases to applications in either a spreadsheet or a table in a databases. But there is another more scalable option, Extended Properties. Extended Properties are key value pairs that can be stored inside of a databases and associated with the database itself or any of the objects inside the database. You can see the extended properties in Management Studio by right clicking on an object and selecting properties. In the property window there will be a tab for Extended Properties. The following images show how you can see the Extended Properties for a database. Right click on the database and select “Properties”. On the left side click on the “Extended Properties” tab. On the Extended Properties tab you can see the key value pairs that have been defined for the object (or not defined as in this case). To add an extended property to the database it is as easy as typing the key in the first empty row under “Name”. Then if you want to assign a value to the property just enter that next to it under “Value”. The following images show how to add an Extended Property. Enter the name of the Extended Property under “Name”. If you wish to assign the property a value you can do so now by entering it next to the name of the Extended Property under “Value”. But why would we want to use these Extended Properties? In order for us to scale our support for SQL Server systems we have to do our best to make the environment as self documenting as possible. 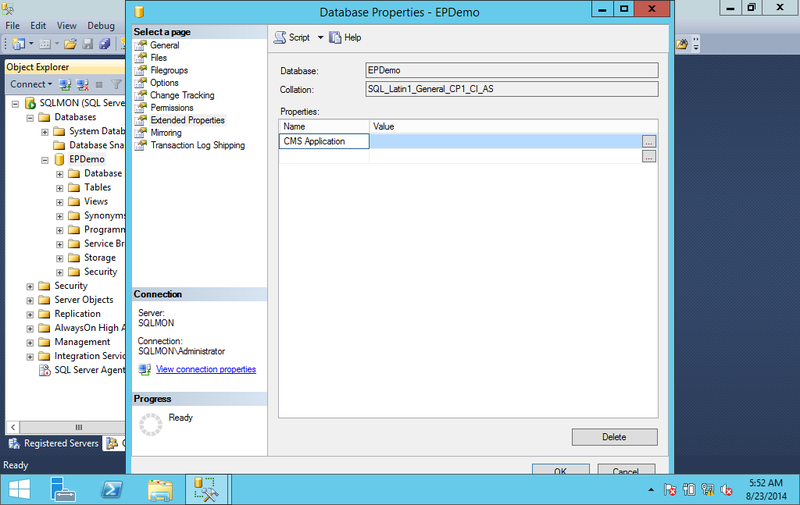 So, as in the examples above, you can create an Extended Property in each of your databases that keeps track of the application(s) supported by the databases. This means that if the database moves from instance to instance you always know what the database is supposed to be supporting. This also allows you to answer the question proposed above definitely with a single query without having to translate databases to applications using a spreadsheet or a lookup table. Below is an image of some Extended Properties I have found beneficial over the years. We have discussed how you can use CMS to query Extended Properties to answer questions, but we can also improve Central Management Servers with Extended Properties. You will notice in the image that there are two Extended Properties on this database prefixed with “CMS”. We will show in a later blog post how we can use these Extended Properties to build dynamics groups inside of CMS. But that is for another day.